Unitron, a Canada-based manufacturer, is linked with the Sonova Group, a global provider of hearing instruments. Unitron, founded in the Kitchener-Waterloo region of Ontario, also known as “Canada’s Silicon Valley,” has been producing hearing aids for the past 50 years, making a huge impact worldwide. Built upon years of research and collaboration, Unitron’s hearing aids treat a wide range of hearing loss and are available in many different styles to meet the aesthetics and functionality required by diverse hearing aid wearers. All Unitron hearing aids are equipped with Era, a unique and fast processing system essential to digital hearing technology. When wearers receive sound from their environments, Unitron hearing aids process these stimuli and eliminate unwanted noise to give wearers access to a clearer quality of sound. Unitron hearing aids come in three main styles: receiver-in-canal, behind-the-ear, and in-the-ear, along with the Max, a “Super Power” hearing aid designed specifically to address severe to profound hearing loss. The Max is the first of its kind to provide speech intelligibility to people experience severe to profound levels of hearing loss. Its battery has a long life, compared to other hearing aids of its caliber. Worn behind-the-ear, the Max offers a sleek design, as well as a sturdiness that holds up against water and extreme elements. In all of their hearing aids, Unitron offers AntiShock, a technology which tempers the sharp sounds of voices, slams, bangs, etc. in any environment; SmartFocus, which enables wearers to hone in on the sounds they want to here in challenging environments, such as a conversation in a busy restaurant; SmartAlert, which wirelessly connects to alarm and security systems in your home to keep you well-connected and safe; and the aforementioned Era, a fast and powerful processing system that improves sound quality. Some Unitron hearing aids are equipped with the North Sound Nav technology, which offers a platform of seven listening environments and automatic adjustment as the wearer moves between different spaces. 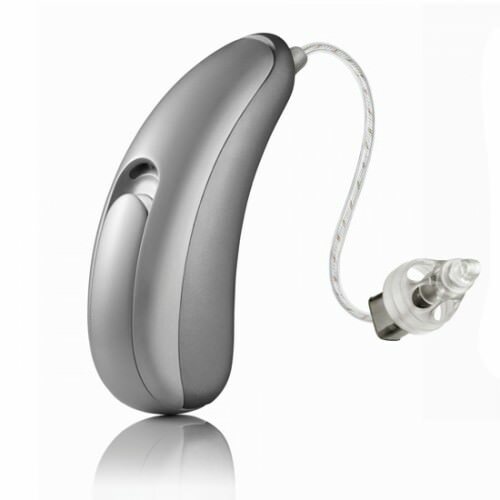 Unitron’s receiver-in-canal hearing aid, the Moxi, is known for its long battery life and discreet design. Similarly, the Unitron Stride hearing aid is available as behind-the-ear and in-the-ear, both offering a discreet aesthetic for wearers, while also maintaining innovative program features and ease of control. All Unitron hearing aids are customizable with TrueFit software, to provide wearers with a comfortable and seamless listening experience. Unitron’s people-focused philosophy extends to their Flex program, which contributes to their research and innovation. With Flex, Unitron offers customers the opportunity to experience their hearing aids on a trial basis, in addition to in-clinic counseling during the transitional time, with the option to make adjustments and try other models before settling on the best hearing instrument for their needs. The Flex program keeps a log of the wearer’s daily experiencing, recording the adjustments of volume and program throughout the day. This data assists in further invention and design for better hearing aid technology, while giving audiologists a better sense of their patients’ hearing needs. Most Unitron hearing aids are equipped with Bluetooth capability, enabling wearers to connect wirelessly to home entertainment systems, personal electronic devices, and smartphones for expanded accessibility. Interested in Unitron Hearing Aids? Contact us today to schedule a thorough hearing evaluation with our Audiologist Matthew Favinger. At your appointment, Matthew will assess your hearing and help you find the right hearing solution for you.